Want To Travel The World And Get Paid For It? 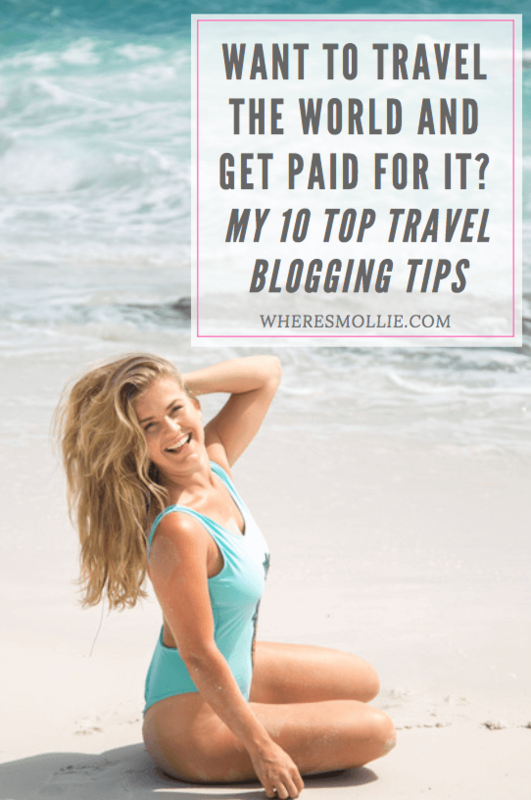 My 10 Top Travel Blogging Tips! First of all, let’s adjust the title ‘travel blogger’ to online magazine director. I often find myself reintroducing myself as exactly this. I feel the word ‘blogger’ is ridiculously undervalued and is often perceived to be the job of someone that has accumulated followers, somehow, and therefore spends their life showing off and jaunting around the globe. Sure, there are travel influencers out there doing that and making money purely off social posts, but a blog too? That’s a whole new business of it’s own. If you want to read in depth about the responsibilites and jobs undertaken in running a blog, then read this article I previously wrote here. The truth is, yes I am very lucky to have created myself a job that I love day in and day out, but, just like other travel bloggers – I CREATED MY OWN LUCK. It gets kinda tiring justifying why I get to travel so much and even more so why I (after two years of working for free) now get paid for it. I do get it though, to some people it’s just a new career that they don’t understand. It’s more that I get tired of people looking at me as if I don’t work for the perks I appear to get. Again, I like to rephrase ‘I get paid to travel’ to ‘I get paid to create valuable content for different brands in different locations’. I’m writing this post because I don’t want to pretend travel blogging is all fun and games. It’s an insane amount of fun but it’s also a hella lotta work, commitment and compromise. I don’t want you to to be filled with jealousy. I don’t get a kick out of that, so I’m not going to lie to you. You wouldn’t expect to place your product for free on the adverts airing between The X Factor, would you? Just like TV marketing, radio and magazine, once you have captured an engaged audience (like I now have) people see value in that, and in order to promote their product or service to your audience, there is a charge. Obviously I am not on as large a scale as the X Factor, but it’s the same concept. Sure, I don’t charge for everything, but just like the director or ITV or LOOK magazine – I have to make a living. So how do you get to where I am? What tips have I got for you? 1. You have to FULLY believe in and love the topic that you are blogging about and creating content around. Whatever topic you want to start your blog on, whatever it is you are passionate about – I can guarantee there are other people interested in and as passionate about it as you are. They are your potential audience. Write about and capture the very thing you love – and stick to it. It took me 12 months of my blog to realise travel was my avenue. Don’t write about what you think you should write about or write about travel because ‘you want to see the world’. It will be the way you write and dedicate yourself to the art through your passion that gains the respect you’re going to need from followers, brands and potential clients. The biggest obstacle to setting up and running a full time blog is time. Starting a travel blog is starting up a business – just like any other. If you are going to take it seriously you have to work on strategies, make a business plan and invest a hella lotta time in building it from scratch. Taking the photos and travelling is just one job of about 60, I’d say. Admittedly, I do go to extremes and am very thorough with my approach to blogging but still, what you see online is a very small part of what goes on behind the scenes… very small. Starting a blog very quickly requires full-time hours which, if you have a full-time job too, can become exhausting very quickly. I managed to juggle this with running a part-time beauty business from home for the 18 months it took me to earn some money from my blog. Because of the latter, committing yourself to your blog can eventually mean some kind of risk taking. This may mean going part-time on your full-time job to free up more hours or eventually taking the plunge to go full-time on your blog. Particularly for the travel industry, trips can come up last minute and when starting out you may get super last minute offers as ‘bigger bloggers’ drop out. Being flexible with time and days free can seriously pay off when it comes to taking up these opportunities. When starting out it’s important to network and gain access to as many trips and as much content opportunity as possible. There is danger in saying yes to everything and over-working yourself, so I’m not promoting it, but at the same time, more than ever now, it’s a very competitive industry. You have to be willing to go above and beyond to make a good impression or to make impressions at all. Wherever possible, take the trip, attend the event, meet for the coffee, shout out on social media, create content for free. 6. Realise that networking is KEY. Following on from 5, you need to make as many connections and contact as physically possible. At the same time, do not trample over people or use people, but be a people-person. You literally NEVER know who you’re talking to, what company they’re about to start working for or what door they could open up for you. No one likes a show off, a know it all or a blog-wanker. 8. Don’t look for a fast fix. If you’re heading into the business for free travel and free things, you will probably fall flat on your face in a few weeks. You’ll soon realise you’d rather just ‘pay for it’ than spend the countless hours working for it. Building a blog, for most of us, has been a long-term investment and brands will see that. 9. Create awesome content and stay true to your brand. Before working with you, brands will watch your content, watch your approach to your topics and keep an eye on engagement. If they are looking to invest in you, of course they want to know your value and work ethic. It’s happened on many occasions to me and luckily for me it paid off as I’ve been consistent and thorough from the beginning. Even if you dont have many followers, a brand may love your photography so much that they hire you to capture creative content for them and use it on their channels. Enjoy it! It’s going to be a lot of hard work and you won’t get paid for a while but hard work always pays off and when the first pay cheque comes in it will be so worth it! I hope that has given you another valuable insight into how I started my blog and got to where I am. Have you got any questions about travel blogging?